Imagine taking a vacation with your honey and visiting a place that’s drop dead gorgeous. Imagine that you have so many exciting entertainment, attraction and adventure options that you’re never bored. And imagine holing up in the perfect little rustic cabin, just the two of you. You can do all that at Shady’s Barn. Shady’s Barn is a charming 1 BR, 1 BA Wears Valley cabin rental from Great Cabins in the Smokies. It’s tucked away into a secluded, woodsy clearing that’s almost like a fairytale. You’ll be enchanted with it from the moment you set eyes on it. A warm wood interior greets you as you enter this cozy cabin. Settle in and get comfortable here because you’ll want to stay awhile! You’ll love the fact that this charming cabin has a covered outdoor hot tub. Private and secluded, it’s perfect for unwinding after your day of traveling or sightseeing. Open a bottle of wine or brew a cup of hot tea to sip as you relax, unwind, and reconnect with each other. Watch for wildlife or just enjoy the beauty of the natural setting. Life doesn’t get much better than this. You’ll find the spacious bedroom just right for your special getaway. Enjoy satellite TV or a movie on the flat-screen TV as you snuggle in for the night. A fully equipped kitchen gives you the option of cooking for two if you’d like. Whip up breakfast in bed. Or grill up some steaks on the charcoal grill and have dinner at the picnic table. This Wears Valley cabin setting is so enchanting; you’ll feel like you’re in a world of your own. And after all, isn’t that why you came? 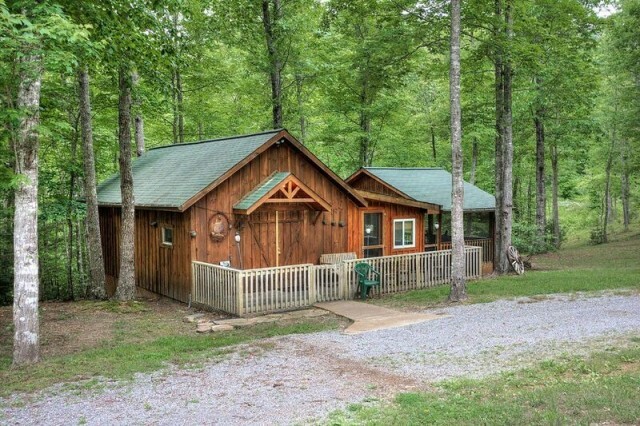 This rustic Wears Valley cabin is perfectly situated in the woods, close enough to Pigeon Forge to see the sights, but far enough away that you can easily forget they exist if you’d rather. Dollywood, the Titanic Museum, and WonderWorks are all waiting for you. Visit the unique shops and restaurants on Pigeon Forge Parkway or explore The Island, a unique shopping and entertainment complex. The options are nearly endless. You’re also located just a stone’s throw from Townsend, TN, where the locals go to enter Great Smoky Mountains National Park. This “secret entrance” is much less used by tourists than the entrance in Gatlinburg, and you’ll appreciate the convenience of entering the park at your own pace. Hopefully you’ve packed hiking boots, because there are over 850 miles of maintained hiking trails in this national treasure. Visit waterfalls or try your hand at fishing in one of the many mountain streams and creeks in the park. Or pack a picnic lunch and enjoy dining al fresco with river rocks as your seating area, and the sound of burbling water creating a delightful musical backdrop for your meal. If this all sounds like your idea of a dream vacation for two, call Great Cabins in the Smokies today to make reservations for Shady’s Barn. Or visit our website to take a look at our other Wears Valley cabin rentals. Sweet dreams!